It can edit almost all aspects of the game excluding 3D object creation. Unofficial 3D Studio MAX, Maya, and Blender plugins have been released to allow people to make their own models. It is designed to allow easy editing while providing extended operation for experts to create more complex objects. All changes, additions, modifications, or deletions by the editor are stored in files called plugins. Bethesda says that a typical plugin (small dungeon, loot, quests, etc...) should be around 200kb in size. Additional models, sound, or music may increase that size significantly though. There is effectively no limit to the number of plugins you can apply to the game. This means that you can download and install whichever plugins suit your fancy. The game has good checks in place to ensure that multiple plugins do not interfere with each other. Plugins can easily be added or removed from the game. Thus, if you install a plugin which messes up the game or you don't like, it can be removed. Typical creation time for a decent plugin is very small. Developers at Bethesda say they were making simple quests and dungeons in under an hour when they first started to use it. The editor uses a drag-and-drop technique to accomplish this. For example, you might drag several dungeon sections from the library to create a full dungeon, and then drag in a few monsters and NPCs and some items/treasure for atmosphere. Simple scripts (no function definitions) can be implemented for most objects in the game allowing for practically limitless possibilities. Tutorial explaining the layout and interface of the CS. The Construction Set is available for digital download from here. It also comes bundled with most versions of the game. 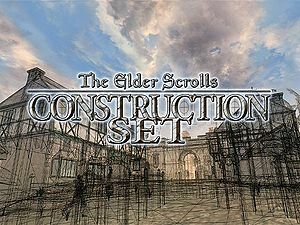 The free Bethesda.Net edition does not include the Construction Set. Keyboard Shortcuts - Useful list of the CS keyboard shortcuts. General Editor Tips - Some short tips to help get you started. Editing Interiors - Editing interior cells. Creating Clean Mods - How to make sure your mods are 'clean' and avoid the dirty save bug. Dialogue Notes - General tips to editing dialogue in the CS. Dialogue Avoiding Greeting Conflicts - Specifically deals with the common problem of greeting conflicts in dialogues. Alphabetical Function List - All scripting functions, sorted alphabetically. Categorical Function List - All scripting functions, sorted by category. Scripting Basics - An introduction to scripting. Scripting Pitfalls - Common and unexpected scripting problems and how to deal with them. Modding for smarties - abot offers his experience and best practices for the serious modder. This page was last modified on 29 March 2019, at 23:58.